Dental implants are one of the most notable advancements in dentistry in the past 40 years—for some very good reasons. This dynamic and versatile procedure, which involves the surgical placement of a tiny titanium post into the jawbone, offers a wealth of benefits including enhanced comfort and confidence, and improved oral health. With years of experience and the latest technology, Dr. Clifford Degel makes the benefits of dental implants available to patients in Queens and surrounding areas. Schedule an appointment with our friendly and knowledgeable staff to see how dental implants can benefit you. Implants are unique in their unparalleled permanence and stability. Surgically implanted into the jaw, the small titanium posts fuse with jawbone in a process called osseointegration. Once the bone has integrated with the posts and they are fully secured, implants essentially become part of the body, and the restorations they support look and function just like natural teeth. Implant-supported dentures offer numerous advantages over traditional removable dentures. Traditional dentures are held in place with a combination of suction and adhesive, and are notorious for their tendency to shift and interfere with speaking and eating. Even partial removable dentures can move around in the mouth and reduce the ability to eat certain foods. With implants, denture wearers do not have to worry about slipping, shifting, clicking, or sore spots where their dentures rub on the gums. In addition, if implant-retained dentures are permanently fixed, then the patient no longer has to remove, soak, and re-affix their prosthetic every day. 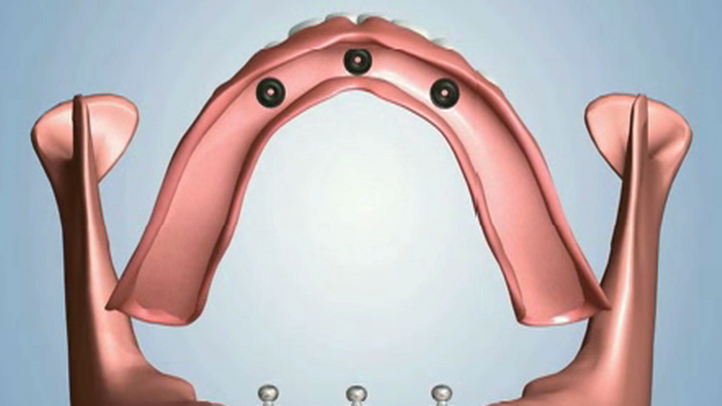 Implant-supported bridges also offer benefits over traditional bridges. Although traditional bridges are a good option for replacing up to three teeth in a row, especially for patients who are unable to undergo implant surgery, they do not offer the same degree of stability and permanence. Gums and bone can recede around a fixed bridge or partial removable denture, creating a noticeable defect. Additionally, the cement that holds the bridge in place can deteriorate over time and allow bacteria to decay the teeth that anchor the bridge. Implants overcome all of these problems while looking as good as or better than natural teeth. Imagine being able to bite, chew, and speak without the slightest worry that your false teeth will slip. With an implant-supported dental prosthetic, you can eat all your favorite foods and speak with confidence. Highly reliable, dental implants truly are the best thing next to your own teeth. They are so natural looking and feeling that you might forget you ever lost a tooth. The effects of having a beautiful smile can be genuinely transformative. Modern implant-supported prosthetics are crafted of high-quality materials that resemble gum tissue and tooth enamel, so they look natural and attractive. And because they can help prevent deterioration of the jawbone caused by tooth loss, they can also help your face retain its natural shape. Dental implants benefit your oral health in two main areas: bone retention and preserving remaining teeth. Biting and chewing stimulates tooth roots and sends the body signals to deliver nourishment to the jawbone to keep it strong. This phenomenon, called the piezoelectric effect, is imitated when implant posts fuse with the jawbone. Implants are the only restorative prosthetic that mimic this natural process. Because conventional crowns, bridges, partials, and dentures only replace the crowns of lost teeth, nutrients that would have been delivered to the jawbone are directed elsewhere in the body. Over time, the jawbone deteriorates and shrinks, creating a sunken facial appearance called facial collapse. Traditional bridges and removable partial dentures both require significant alteration of the adjacent teeth, which must be reduced and crowned in order to support the prosthetic. With implants, natural teeth are left undisturbed, which significantly benefits long-term oral health. Implants can give you back your smile, and they can even help you achieve the smile you always wanted. Simply put, dental implants can enhance your quality of life. Contact our office to see how you can benefit from this revolutionary technology today.